The Pontiac Tempest is an automobile that was produced by Pontiac from 1960 to 1970, and again from 1987 to 1991. The Tempest was introduced as an entry-level compact in September 1960 for the 1961 model year. A highly innovative design, it shared the new unibody Y platform, GM's first, with the Buick Special/Skylark and Oldsmobile F-85/Cutlass, came with a standard four-cylinder engine, and offered a two-speed rear-mounted transaxle automatic tranmission. The line offered the optional LeMans trim upgrade, beginning with a few 1961 LeMans coupes and adding a performance aspect in MY 1962. In 1963, the Tempest was redesigned as a mid-size built on the new GM A-body platform, with its LeMans version spawning the industry-changing signature muscle car, the GTO. Originally options, both the LeMans and GTO were subsequently split off as their own model lines, the LeMans in 1969 and the GTO in 1965. In Canada, Pontiac also marketed a rebadged version of the compact L-body Chevrolet Corsica under the name Tempest from 1987 to 1991. Despite sharing some sheet metal with the Oldsmobile F-85, the first-generation Tempest had several unique features that made it stand apart from the other compact GM cars. Power came from a ground breaking 195 cubic inch (3.2 L) straight-4 engine, marketed as the "Trophy 4," derived from the right cylinder bank of Pontiac's 389 cubic inch "Trophy 8" V8 engine. The other part of the pioneering Tempest drivetrain was a rear-mounted transaxle that was coupled to a torque shaft arcing in a 3 in (76 mm) downward bow within a longitudinal tunnel. This joined the forward engine and the rear transaxle into a single unit, helping to reduce vibration. The design, known as "rope drive," had only been seen previously on General Motors' 1951 Le Sabre concept car. The combination of a rear-mounted transaxle and front-mounted engine very nearly gave the car an ideal 50/50 front/rear weight distribution. This, along with a four-wheel independent suspension, helped make the Tempest a nimble-handling car for the era. The front engine/rear transaxle design also eliminated the driveshaft/transmission tunnel in the front of the passenger compartment, while lowering the driveshaft tunnel in the rear compared with a conventional front engine/front transmission layout. The Tempest's designer, auto industry icon John Z. DeLorean, was Pontiac's chief engineer at the time of its introduction. He wanted the Tempest to be more than just a compact, and he apparently convinced the American motoring press of that: The Tempest was Motor Trend magazine's 1961 Car of the Year. Road & Track praised the Tempest as "exceptionally roomy" and "one of the very best utility cars since the Ford Model A." The Trophy 4 four-cylinder engine was promoted for its economy, but Pontiac also saved money on its assembly: Because it was based on the right cylinder bank of the Pontiac 389 V8 engine, both engines could be built on the same assembly line. There were three versions of the Trophy 4: An economy version with a relatively low 8.6:1 compression ratio and a single-barrel carburetor; a hotter version with a 10.25:1 compression ratio and a single-barrel carburetor; and the most powerful Trophy 4 engine, which had a 10.25:1 compression ratio and a four-barrel carburetor. 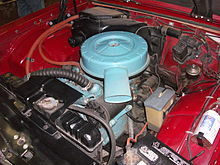 While both Trophy 4 engines (low and high compression) equipped with single-barrel carburetors produced 110–140 hp (82–104 kW; 112–142 PS), the high-compression, four-barrel Trophy 4 engine produced 166 hp (124 kW; 168 PS) at 4,800 RPM and 215 lb⋅ft (292 N⋅m) of torque at 2,800 RPM (all ratings are SAE Gross). The three Trophy 4 engine versions offered fuel economy ratings ranging from 18-22 MPG. Popular Mechanics reported fuel economy of 21.3 MPG at 60 MPH. The Trophy 4 engine was generally reliable, but could be harsh when it was out of tune, due to its inherent lack of secondary balance and absence of balancer shafts. The Tempest was offered with quite a few options such as air conditioning, transistor radios, windshield washers, a parking brake warning light, padded safety dash, child-proof door locks, and dealer-installed seat belts, as such restraints were not yet Federally required at the Tempest's introduction. Another departure from the other Y-body cars was the Tempest's 9 in (23 cm) drum, which used five studs on the same bolt circle ("five-on-four-and-a-half") and 15 in (38 cm) wheels - a configuration unique among General Motors cars. Both Buick and Oldsmobile had standardized their Y-body cars on an odd 9.5 in (24 cm) brake drum with four lug studs on a 4.5 in (11 cm)-diameter circle (a "four-on-four-and-a-half" bolt pattern), with 14 in (36 cm) wheels. This arrangement was also not used by other General Motors cars at the time. Along with the Trophy 4 engine line another optional engine for the Tempest in 1961 and 1962 was the innovative aluminum Buick-built 215 cubic inch (3.5 L) V8, an engine that had first appeared on the Buick LeSabre. It is estimated that just 3,662 Tempests were ordered with the 215 engine, or about 1% of production. This engine produced, in its various incarnations, from 155–215 hp (116–160 kW; 157–218 PS) despite weighing just 330 lb (150 kg) installed. The engine blocks used for 215-V8 engines installed in Tempest models were distinct from 215-V8 engine blocks used in other models because, in addition to Buick factory markings, they were also hand-stamped at the Pontiac plant with the Vehicle Identification Numbers of the individual vehicles that they were installed in. Thus, in 1961, all Pontiac 215 engine blocks begin with "161P"; for 1962 the stamping began with "162P". Further code numbers indicated the car's transmission (manual or automatic). In 1961, the transmission choices were a three-speed column-shifted manual with a non-synchronized first gear, or a two-speed automatic transaxle controlled by a small lever to the right of the ignition switch on the instrument panel. Called TempesTorque in company literature but unmarked on the unit itself until 1963, it was similar in concept to the Chevrolet Powerglide automatic transmission used on the Chevrolet Corvair, though few parts overlapped. For 1962, a floor-mounted, fully synchronized four-speed manual transmission became available. At its introduction, the Tempest was only available as a four-door pillared sedan and as a station wagon that, like other Pontiac station wagons of the time, had the name Safari added to it. A pair of two-door coupes (one of which was named LeMans) were added at the end of 1961, both in the 1961 body style. For the 1962 model year there were four Tempest models available: a sedan, a coupe, a station wagon, and a convertible. Customers wanting something fancier could opt for the LeMans trim package upgrade, which featured front bucket seats. Tempest LeMans models were available with either the coupe or the convertible; there was no LeMans sedan or station wagon. And although Oldsmobile and Buick offered pillarless hardtops on the Cutlass and Skylark respectively, Pontiac did not offer a pillarless hardtop LeMans model. In 1963, the LeMans became a separate series; its sales were nearly 50 percent of combined Tempest and Le Mans production. 1963 models, referred to as senior compacts, were slightly larger and heavier than the 1961 and 1962 models had been. These new models featured a redesigned transaxle that improved handling, as well as a high-performance option that was much more powerful than the rarely-ordered 215-V8. This new V8 option for 1963 was Pontiac's 326 cubic inch (5.3 L) V8, an engine with the same external dimensions as the venerable "Trophy 8" 389, but different internal components designed to produce more torque. A new version of the automatic transmission (now officially stamped TempesTorque on the case) was redesigned to handle the new V8's additional torque. The four-speed manual transmission had not been redesigned, and very few V8-equipped Tempest models were built with this transmission. The three-speed manual transmission remained available for all engines. The high-compression 326 V8 engine's output was 260 hp (194 kW; 264 PS) and 352 lb⋅ft (477 N⋅m) of torque (SAE Gross). The actual displacement was 336 cubic inches, but according to lore, since General Motors management edict declared that no GM compact was allowed to have an engine that was larger than the Chevrolet Corvette 327 V8, the advertised displacement for the Tempest V8 was 326 cubic inches. However, for 1964, the engine's displacement was adjusted so that it actually was 326 cubic inches, making the 1963 "326 V8" a single-year engine. The cast-iron V8 engine increased the Tempest's weight by 260 lb (120 kg) over the weight of a Tempest equipped with a Trophy 4 engine; front/rear weight distribution changed somewhat to 54/46. Performance with a 326 V8-powered Tempest was strong enough that Car Life magazine wrote "No one will wonder why they didn't use the 389." Fuel economy with the 326 V8 could be as high as 19 mpg. The 326-V8 option proved popular: 52 percent of the 131,490 Tempests and LeMans models sold in the 1963 model year were ordered with the 326-V8 option. Perhaps the most famous of all Tempests were the 12 1963 "Super Duty" cars built to compete in the NHRA Factory Experimental class. These were put together at the Pontiac plant in Michigan over Christmas 1962 with the knowledge of an impending General Motors ban on factory racing. Among those who successfully raced them was Wild Bill Shrewsberry, who turned low 12-second quarter-mile runs in the 1963 NHRA Winter Nationals driving for Mickey Thompson. Shrewsberry still owns his car and it is still equipped with Pontiac's "Powershift" transaxle as retrofitted later in the 1963 season. Developed specifically for the Super Duty model, this was essentially two Chevrolet Powerglide automatics in a single four-speed unit, allowing clutchless shifting in much the same manner as modern drag racing transmissions do. On October 31, 2008, one of the most rare factory race cars, the missing Stan Antlocer Super Duty Tempest Le Mans Coupe, was auctioned on eBay. The seller started the auction at $500 being unaware of the car's true value. Eventually, the car was sold for $226,521. In 1964, the Tempest was redesigned as a more-conventional vehicle and enlarged from a compact to an intermediate-sized car with a 115 in (2,900 mm) wheelbase and an overall length of 203 in (5,200 mm). The unibody, curved driveshaft and transaxle were gone, replaced by a traditional front engine, front transmission, body-on-frame, and solid rear axle design used by all of GM's other cars but the Corvette and Corvair. Together with its sister cars (the Oldsmobile F-85/Cutlass and Buick Special/Skylark), the Tempest/Le Mans moved to the new A body platform shared with the new Chevrolet Chevelle, and all three cars received updates and modifications standardizing them throughout—including the wheels—by GM edict. The Le Mans name was discontinued as a separate series, so now the cars were, in ascending order, base Tempest, Tempest Custom, and Tempest Le Mans. Replacing the previous "Trophy 4" inline four-cylinder engine as standard equipment was a new 215 in³ Pontiac straight six with one-barrel carburetor and 140 hp (104 kW; 142 PS). This six was basically a smaller bore (3.75") version of the 230 cu in (3.8 L) Chevrolet straight-6 offered as Pontiac exclusive. Optional engines included two versions of the 326 in³ Pontiac V8 introduced the previous year, a two-barrel 250 hp (186 kW; 253 PS) regular fuel option; or the 280 hp (209 kW; 284 PS) 326 HO engine with four-barrel carburetor and 10.5:1 compression ratio which required premium fuel. Transmissions included a standard three-speed manual with column shift, four-speed manual with floor-mounted Hurst shifter or a two-speed automatic; the latter was a version of Buick's Super Turbine 300. The popularity of the high-performance 326/336 V8 in the Tempest-based LeMans package the year before prompted Pontiac to give the option a special, sporty name: the GTO, after the Italian abbreviation "Gran Turismo Omologato" used to designate specially equipped street cars homologated for racing (though the opposite, producing a mandated minimum of street-legal race cars to meet the homologation requirement, is the norm). Available with Pontiac's largest V8, the 389 cu. in. (6.4L), and equipped with a four-barrel carburetor (producing 325 hp) or the soon to become iconic 345 hp 3 x 2 barrel Tri-Power set-up, the GTO proved to be the defining muscle car of the 1960s. Unsurprisingly, the success of the GTO prompted Oldsmobile to rush out its own high-performance option package for the F-85/Cutlass called the 442, and the next year for Buick to release a high-performance version of the Skylark called the Skylark Gran Sport, or GS. Both cars would enjoy success and join Chevrolet's Chevelle SS in GM's effort to capitalize on the exploding muscle car era. Engine offerings for the 1965 Tempest were the same as 1964, except the 326 HO was uprated to 285 hp (213 kW; 289 PS) and the GTO 389's uprated to 335HP and 360HP via higher rise intake manifolds. Styling changes included a new split grille with vertical headlights similar to the larger Pontiacs, revised taillights and a more slanted rear deck. A two-door hardtop coupe was added to the Tempest Custom line, while the Le Mans got a four-door sedan with a plush interior done in Preston Cloth trim similar to the full-sized Bonneville Brougham. A major facelift was made on the 1966 Tempest that included more rounded bodylines with a Coke-bottle effect similar to the full-sized Pontiacs. New four-door pillarless hardtop sedans were added to the Tempest Custom line. Under the hood, the Chevy-derived 215 six was replaced by a new 230 in³ Pontiac overhead cam six, the only such engine found in an American production car at that time. This was also the first American-built engine to use a belt to time the camshaft to the crankshaft rather than a chain. The base OHC had a one-barrel carburetor and was rated at 165 hp (123 kW; 167 PS), designed for economy buyers. Optionally available as part of the Sprint option package on two-doors was a four-barrel, high-compression 207 hp (154 kW; 210 PS) version of the OHC six, marketed as an alternative to higher-priced European sport sedans, which had similar OHC engines. For those wanting V8 power, the 326 and 326 HO options continued with horsepower ratings of 250 and 285 hp (213 kW; 289 PS), respectively, and GTO engines stayed the same. Only minor changes were made to the 1967 Tempest, Custom and Le Mans models. The GTO 389 cu. in. V-8 was replaced by a new 400 cu. in. V-8. The Rochester 4bbl. carburetor replaced both the standard GTO Carter AFB 4bbl and the 3 × 2bbl. carburetor option. The Turbo Hydromatic TH-400 replaced the previous Buick Super Turbine two speed automatic. The 326 cu. in. V-8's remained unchanged. The 4bbl. OHC six was uprated to 215 hp (160 kW; 218 PS). Front disc brakes were a new option along with a stereo 8-track tape player and hood-mounted tachometer. All 1967 Pontiacs got GM's safety package, mandated by Federal law, which included a dual-circuit braking system, energy absorbing steering column, wheel, and interior, shoulder belt anchors, four-way hazard flashers, and a new directional signal control that could be "flicked" for lane changes. A completely restyled Tempest was introduced for 1968 with streamlined Coke bottle styling, concealed windshield wipers, and a return to horizontal headlights. Two door models rode on 112 in (2,800 mm) wheelbases and four-door on 116 in (2,900 mm). The 230 cu. in. overhead cam sixes were enlarged to 250 cu. in., with horsepower ratings unchanged while the 326 V8 was replaced by a new 350 in³ V8 with horsepower ratings of 250 with two-barrel or 320 with four-barrel carb. The same lineup of models including the base Tempest, Tempest Custom and Le Mans continued as in previous years. Other than elimination of vent windows on hardtop coupes, styling only received minor revisions for 1969, when the Tempest Custom was renamed the Custom S for this one year. However model offerings were the same as 1968. A new three-speed Turbo Hydra-matic 350 automatic transmission was introduced and available with all engines as an alternative to the older two-speed. Engine offerings were the same as before except for the 350 HO V8 engine gaining five-horsepower to 325. A new locking steering column with relocated ignition switch was introduced and front seat headrests became standard equipment. A new GTO option became available, The Judge. Featuring special decals, two Ram Air versions of Pontiac's 400 engine, and a rear spoiler, The Judge was originally conceived as a barebones muscle car based on the Tempest to compete with the new sub-$3,000 Plymouth Roadrunner; however, the plans for a new model fell through and Pontiac division head John DeLorean opted to create a GTO variant instead. Minor styling revisions, that included a new front grille treatment, highlighted the 1970 Tempest, which would be the final year for the nameplate in the U.S. Initially, the line was down to just two- and four-door sedans but expanded at mid-year with the introduction of the low-priced T-37 hardtop coupe, billed as GM's lowest-priced hardtop coupe. The Custom S became the Le Mans this year and the previous Le Mans series was renamed the Le Mans Sport. The Pontiac-built OHC six-cylinder engine was replaced by a Chevy-built 250 in³ inline six while the 350 V8 was down to a two-barrel 255 hp (190 kW; 259 PS) version. New engine offerings included 400 in³ V8s rated at 265 hp (198 kW; 269 PS) with two-barrel carburetor and 8.6:1 compression ratio or 330 with four-barrel and 10.25:1 compression. The Tempest nameplate was phased out after the 1970 model year. For 1971, it would be replaced by a new T-37 series that included each of the three bodystyles offered on the 1970 Tempest and T-37. After this year, the T-37 would be dropped and for 1972 all Pontiac intermediates took the Le Mans nameplate except the GTO. Pontiac marketed a rebadged version of the compact L-body Chevrolet Corsica as Tempest, for Canada and Israel only, beginning in model year 1987. Discontinued in 1991, the Tempest was replaced with the Grand Am sedan. The 1987-1991 Pontiac Tempest came in two trim levels, base (equivalent to the U.S. Corsica LT) and LE (equivalent to the U.S. Corsica LTZ) The main differences that separates the Tempest from its L-Body twin are different grille, emblems and taillights (the taillights were later adopted as the U.S. Corsica's taillights). The only other differences were wheel options, DRLs and a metric instrument cluster. This model was also sold briefly in Israel, as there are brochures showing Canadian-spec models from 1990/1991. ^ "Directory Index: Pontiac/1962_Pontiac/1962_Pontiac_Tempest_Brochure". oldcarbrochures.com. ^ a b "1961Pontiac Tempest bw-14-15". oldcarbrochures.org. Archived from the original on 2015-02-04. ^ "Directory Index: Pontiac/1962_Pontiac/1962_Pontiac_Tempest_Brochure". Oldcarbrochures.com. Retrieved 2012-05-31. ^ Chang, Richard S. (April 9, 2010). "Auto Ego, 1961 Pontiac Tempest, When Half a V-8 Is Enough". The New York Times. ^ Flory, J. Kelly (2008). American Cars 1946-1959: Every Model Year by Year. McFarland. p. 1021. ISBN 978-0-7864-3229-5. ^ "DeLorean and the Pontiac Tempest - HowStuffWorks". HowStuffWorks. ^ "1961 Pontiac Tempest Accessories-04-05-06-07". oldcarbrochures.org. Archived from the original on 2015-02-04. ^ "Hemmings Motor News: Master Wagon". Hemmings.com. 2008-05-01. Retrieved 2010-10-19. ^ Tutor, Chris (2008-11-10). "eBay Find of the Day: 1963 Le Mans Tempest sells for $226,521". Autoblog.com. Retrieved 2010-10-19. ^ "Report on the "barn find" 1963 Super Duty which also chronicles Wild Bill Shrewsberry's accomplishments at". Sportscarmarket.com. 2009-02-28. Retrieved 2010-10-19. ^ "1963 Pontiac Super Duty LeMans Coupe". Sportscarmarket.com. Retrieved 2019-03-21. ^ Terauds, John (1996). The Canadian Car Buyer's Survival Guide: How to Buy Or Lease the Right Vehicle at the Right Price. Dundurn. p. 109. Wikimedia Commons has media related to Pontiac Tempest.